AWST International: Childrens Sports Watches, Equine Kids Watches! Kid's Watch: Rubber Strap size 5.5 inch - 6.75 inch. Japanese Movement. Great gift idea! • Kid's Watch White Horses LAVENDER #JW73: 3D Lavender Kid's Watch with White Horses. ORDER NOW! 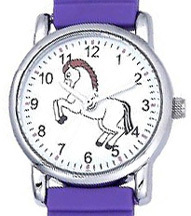 • Kid's Watch White Horses PURPLE #JW71:3D Purple Kid's Watch with White Horses. ORDER NOW! 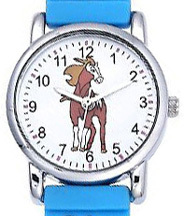 • Kid's Watch Wild Horses BLUE #JW72: 3D Blue Kid's Watch with Wild Horses. ORDER NOW!